What exactly goes through your mind when you watch above image of Mumbai Local Train? 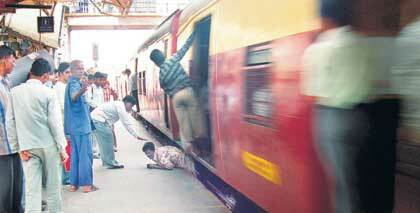 First time, I saw this image, I thought that aamchi mumbai guy fall down of the train, and then running train resulted him in a dead body. I mean, look closely, analyze it. What do you see? A fast train running, a guy looking so helpless stuck in between platform and train. What exactly should have happened? Just like others this man too had a dream of his life Just like others, he too was in hurry to reach somewhere Just like others, he too pushed his way into the crowded train Just like others, this man too wanted to get going before he got delayed But, but, unlike others, he slipped and fell in the gap between the train and the platform at Kandivali station of Mumbai. And eight bogies of train went over him, he was helpless all the time. Now, look at the image below. This man was one of those luckiest people in the world, who had a close encounter with death and they cheated it. The man obviously has a guardian angel and supportive bystanders who told him exactly what he shouldn’t do at the moment – move. And so, the man lay between platform and train absolutely still as a statue as eight bogies of local train passed over him just few centimeters from his head. Within few seconds the 12-coach local train passed over him and the man clambered out, unaided, unhurt. He was shocked and unconscious for a while to talk to other passengers after his near-death experience. Now they advisers will come out with golden advise as ‘He shouldn’t have run in such a hurry’. Well, if you live in Mumbai, and local train is your medium of transportation, you would know that this advise stands no where in practical life. Hurry – is in breath of Mumbains. They have to reach somewhere in-time. And there are no empty-trains for them. On regular bases, they have to rush, hurry and get inside a bogie along with hundreds like-people. God must be pitty and blisful on this man that he cheated death on that day. Train accidents do happen sometimes, but life goes on. This incident reminds me of M. Night Shyamalan‘s movie Unbrekable where Security Guard David Dunn (Bruce Willis) miraculously survives a catastrophic train crash outside Philadelphia. Not only is he the sole survivor out of 132 passengers, he also is completely unharmed. Also check out below video. A couple was trying to pass rail crossing, unknowing a Shatabdi Express was coming over that lane only. This couple was saved by nano seconds.